Years ago, we were running quite a few lead generation campaigns combining direct mail and telemarketing. But eventually, outbound “interruption marketing” like direct mail and cold calling gave way to cheaper and more effective inbound marketing techniques like blogging, SEO, and social media. In fact, we haven’t done a direct mail campaign in years here at Juice Marketing. Our clients (Software VARs) simply weren’t interested … until recently. Just like bell bottom jeans, old trends have a way of coming back around. We recently had several inquiries about direct mail in a span of just a few weeks. Everything from ERP and CRM to wholesale distribution and construction. 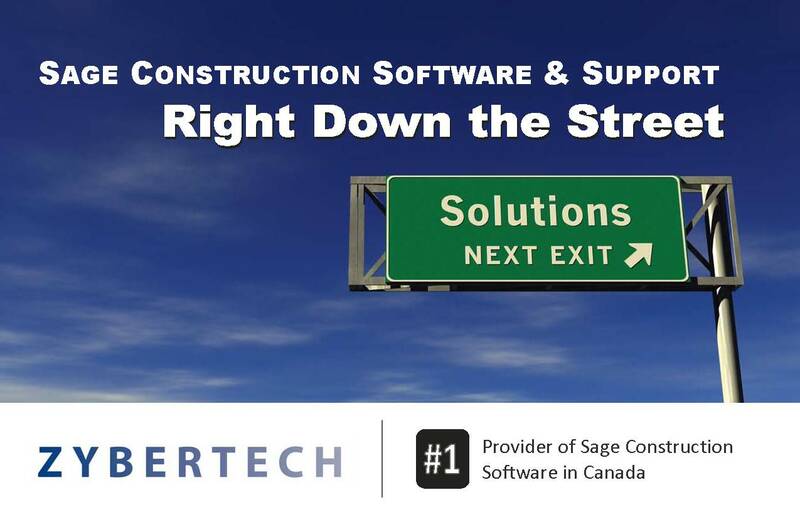 In fact, here’s a direct mail piece we put together for Zybertech, a Sage Construction Software partner, who wanted to drop a postcard in the mail and let construction companies in their local area know that there was a Sage technology provider right down the street. Most of the recent inquiries are from partners who just want to chum the local waters and see if they get any bites. No big multi-touch campaigns running for months on end – just a postcard or two to local businesses. Sidebar: Check out 6 Simple Ways to Improve Local Search for more “Local Marketing” ideas. Perhaps it all makes sense. Why not try a marketing tactic that has fallen out of favor now that everyone is busy taking a ride on the inbound marketing train? Far fewer companies are using direct mail these days which means there are fewer letters and postcards competing for attention. The CFO or business owner that was getting stacks of mail years ago probably has a far smaller pile to contend with today (at the same time, the competition to get into his/her email inbox has certainly increased). A Direct Mail Rebirth or Just Coincidence? The question to you is this … is direct mail making a comeback? Is this the start of a rebirth for direct mail or just a few inquiries that coincidentally came at the same time after years of hibernation? Hey Mark, I just wanted to let you know that our postcard went out last week and we just started our telemarketing campaign today. We have already gotten 2 leads. Real prospects that are a great fit and want to see a demo of Sage 100 Contractor! That sounds a lot like success to me! P.S. If you’d like to send a postcard like the one above to YOUR prospects, drop us a line here at Juice Marketing. People talk about direct mail being ignored, but a well-targeted direct mail piece that instantly communicates real benefit to the customer has a much greater chance of being read than a commercial email in most people’s in boxes. Sure it costs much more per impact, but if that impact is really powerful, it can still be much more sucessful. Totally agree on the importance of headlines Joel – regardless of format or platform. In fact, Twitter is one big stream of headlines. If yours isn’t compelling, the rest of the message won’t be read – social media, direct mail, email, or anything else. I’ve been experimenting with this for some time now and it definitely has its merits. The thing is it requires a pretty hefty investment. Normal letters or fliers don’t typically make it past the gate keeper, but packages always do. Patrick – agree, it can get expensive if you’re sending packages or dimensional mail. You might try sending off-sized or jumbo postcards (that can still stick out) to see if they get similar attention without the cost of a package. The tricky thing about direct mail is that plenty of customers have learned to just ignore unwanted mail. It takes something really special and unique to get their attention and not just end up on the mail table or in the trash. Joe – I think you’re right about sending something that really sticks out (dimensional or “lumpy” mail) when direct mail was at its most popular. But as I tried to point out in the post, the bar might be a little lower right now since direct mail has fallen out of favor and there are fewer pieces of mail to compete with. It’s hard to say for sure and the “right” answer reveals itself through testing – but if I were dipping my foot back into the direct mail pool today, I’d start with something basic like a postcard and then “up my game” with something more prominent/eye-catching if I didn’t get the response I hoped for.